World Climate Ambassador, Dr. Chang Kwon (Benjamin) Chung holds a Ph.D. in International Business Strategy and has 20 years business experience. He is Adjunct professor at the Seoul School of Integrated Sciences and Technologies and the President of the Korean System Dynamics Society. He is also the President of System Leadership Institute located in Seoul which is non-profit organization for System Dynamics (SD)/Systems Thinking (ST) education for pre-college students. He teaches SD/ST in several universities, public service agencies of local government, pre-college schools, and companies. In 2016, he collaborated with Seoul Metropolitan Office of Education for a Future Education of Children project and and teaching SD/ST to teachers. Previously, Prof. Chung worked for the Ministry of Strategy and Finance of Korea on evaluation of public agencies (2015). 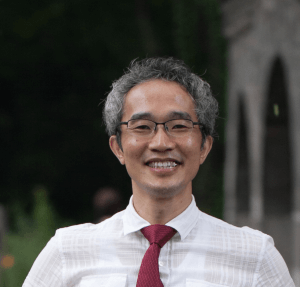 Prof. Chung has been running World Climate Simulation events with his members in South Korea since August 2016 as part of a research project examining the impact of World Climate on learning outcomes. The number of events is still increasing. You can read his paper here presented at the 2017 International Systems Dynamics Conference in Boston, US. Benjamin has performed ballet three times.